Abusive behavior in any marriage or relationship can take on many forms beyond physical violence. Emotional or psychological abuse is particularly insidious because unlike physical abuse, it leaves no marks on the outside. Emotional abuse can happen to anyone, young or old, male or female, and it can cause mental and emotional pain. If you believe you’re in an emotionally abusive marriage, it’s important to know what to look out for, how it can affect your divorce, and resources if you need help. Emotional abuse is often present in relationships that are more broadly abusive, but it doesn’t always accompany physical violence. Physical violence is not a requirement for a relationship to be considered abusive. Much like physical abuse, however, emotional abuse often means the abuser is attempting to gain control or power over someone. Those closest to the abuser are typically the targets, especially a spouse or intimate partner, other family member, or even a child. Emotional abuse is often about control. 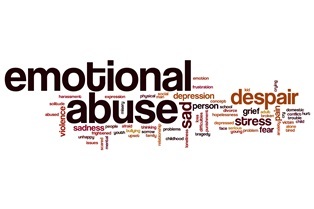 One hallmark of emotional abuse involves dominant behaviors that are intended to control the victim’s behavior such as verbal abuse or insults, intimidation, or threats. This can include threats of harm to the victim or to others. Some abusers may threaten self-harm as a way of controlling and manipulating others, as well. As a means of control, abusers may also destroy or threaten to destroy, withhold, or sell property, especially property that is emotionally significant to the victim. Emotional abuse may involve unpredictability. Another common hallmark of emotional abuse is unpredictability. Some abusers may go back and forth between “normal” behavior and behaviors that are controlling, demeaning, or insulting to their victims. This constant uncertainty can cause victims to live in a state of fear and unease, unsure of what will cause the next “incident.” Victims may try to change their own behavior to prevent another outburst, but this cycle is repeated again and again, and it may escalate over time into other forms of abuse. Emotional abuse may involve isolation. Abusers often try to isolate victims from friends and family. This may be by limiting the victim’s social interactions; regularly spying on the victim’s phone, email, or social media accounts; or even by withholding financial support. These attempts are usually intended to cut off the victim from any support systems that she may be able to use to escape from the abusive relationship. The state of Washington follows no-fault divorce law, which means that abuse victims do not need a reason to file for divorce beyond the belief that the marriage is irretrievably broken. Victims do not need to prove that there is emotional or physical abuse to obtain a divorce, and an abusive partner cannot legally “veto” the divorce. Although he may attempt to coerce the victim into abandoning the divorce proceedings, the choice to continue the divorce lies with the person who filed the paperwork. If there are any records of abuse, such as police reports of violence or other crimes, restraining orders, evidence of drug or alcohol use, or other documentation, this can help victims in court later. The court can take this evidence under consideration when determining how to divide up marital assets, when determining spousal support or alimony payments, and when making a final determination on child custody arrangements via a parenting plan. Nobody deserves to be in a relationship that’s abusive or violent, regardless of age, skin color, gender, or sexual orientation. A family law attorney can assist you in obtaining the protective order you need to keep your family safe, filing for divorce, and in pursuing any criminal charges against your abuser. The attorneys at the Law Offices of Molly B. Kenny understand that this may be a difficult time in your life, and we are here to assist you and your family in your time of need. To reach out to one of our experienced family law professionals, call us by phone or use our email contact form to arrange a private consultation in our Bellevue office.